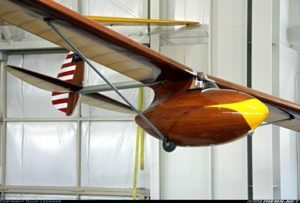 The Baby Albatross is a single-seat, high-wing monoplane glider with a wooden monocoque fuselage pod, an aluminum tube tail boom, and wooden empennage; fabric covered rudder and elevators and strut-braced wooden wings partially covered with fabric. Bowlus considered the needs and skills of the amateur builder from the beginning by adopting a simple and inexpensive aluminum tube to connect the cockpit pod and the empennage which would save the builder considerable time fabricating and assembling a more conventional fuselage built up from numerous wooden or metal parts. To simplify and speed construction, Bowlus used a 17ST aluminum tube to join the fuselage pod with the empennage on the first 65 baby albatross aircraft. Later he adopted a boom rolled from 2024 T3 aluminum sheet and a riveted seam that was manufactured by the Douglas plant in Santa Monica, California.